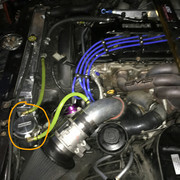 My question is do you think that Y adaptor poses any air flow restriction from the motor properly exhausting its crankcase pressure .... or do you think its ok ..?? Start the car and put your hand over the PCV or VC breather. Ask your self if you really think that thing is restricting. I don't believe so. A 5/8 line is a pretty good size line. But geez, what a cluster **** of awful looking hoses and fittings. I also don't think there's much restriction, your setup should be fine. But I'm not a fan of vent to atmosphere PCV systems (but everyone does it), I'd rather see the PCV hooked up to the exhaust or intake to provide suction on the crankcase, but these are difficult to plumb imo. Regardless, I also have my crankcase PCV changed to a striaght through fitting with a 3/8" hose going to a Evo PCV on a canister; the end goes back to an intake manifold vacuum source. My VC PCV goes to a canister then routed back to the intake before the turbo.